Coloured Prototype images of this year's upcoming Nendoroid Racing Miku 2012 ver. is now up on the Good Smile Company website. 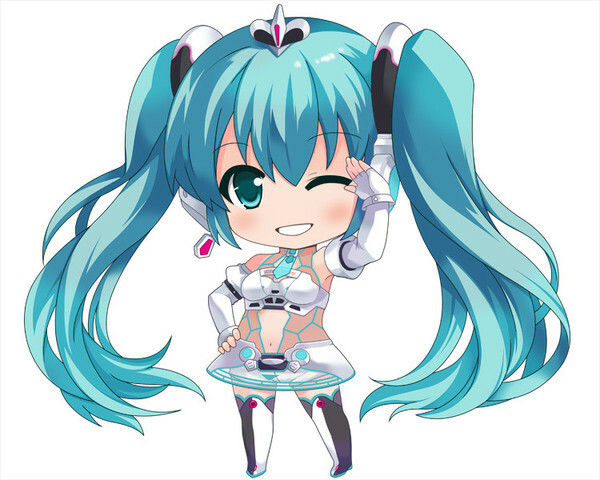 This year's Racing Miku design is based on an illustration by GAN. Stepping away from 2011's more mature look, 2012's Racing Miku has more of a cute feeling to her. As shown, one of her two faceplates is a winking expression, based on the original illustration. Her twintails also seem to consist of at least two separate parts to allow for more dynamic posing of the hair. She also comes with arm parts that allows her to be posed in a saluting stance. A bent leg part also enables her to be posed just like in another official illustration. Of course, following previous Racing Miku versions, Racing Miku 2012 will also come with an open and closed parasol, as well as a miniature Good Smile Racing Nendoroid Race car, which she will be able to ride in. 1. Nendoroid Course A at 8000¥ (excluding shipment fee). 2. Nendoroid Course B at 30,000¥ (excluding shipment fee). More images of Nendoroid Racing Miku 2012 can be found at the MyFigureCollection gallery, which includes images from a recent Good Smile Company Nico broadcast.